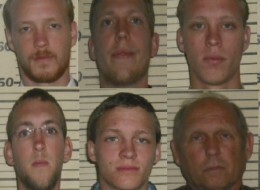 The sheriff of a small county in northwest North Carolina says he is “disgusted” by the parents of six men who are accused of sexually abusing their sister for nearly a decade, at a private family compound. The men’s parents, John Jackson, 65 and Nita Jackson, 54, face charges of felony child abuse. “Part of the investigation revealed that, at one point, the mother observed some of this activity and never did anything about it,” Tilley said of the charges against the parents. “He confided in his pastor and his pastor told him that was wrong and not the way normal families are,” said Tilley. After speaking with the pastor, Eric Jackson allegedly went to the Perquimans County Sheriff’s Office and told them that he, along with five of his siblings, had been sexually abusing their sister. “From there, we had two more brothers confirm what he said,” Tilley said. “Her parents refused to let us talk to her and [they] moved to Colorado,” said Tilley. “I never thought this case would go anywhere because we could not get any cooperation, but they sealed their own fate when they moved to Colorado and that child was ready to talk,” Tilley said.